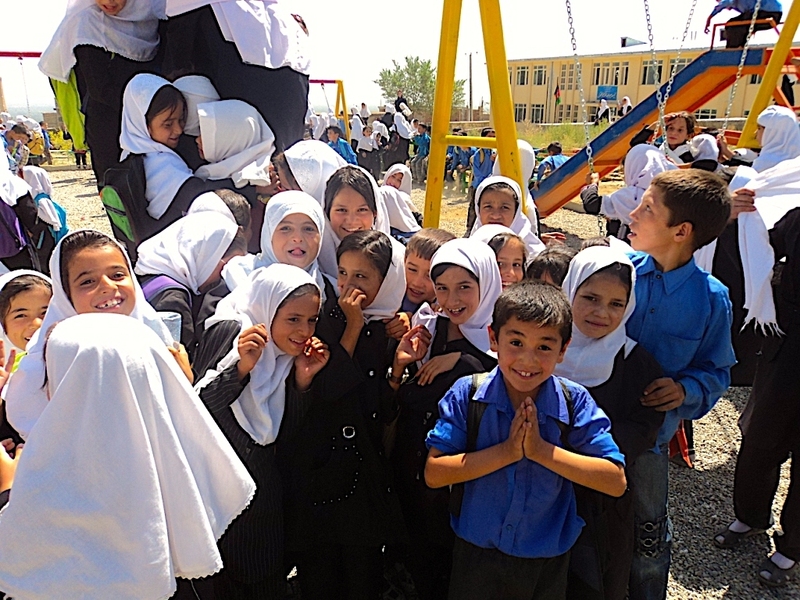 Playground Builders provides safe play areas for schools, orphanages and communities in war-affected countries, such as Afghanistan, Iraq and Palestine. Our mission is to build hope among children in the world’s conflict zones by providing safe places to socialize, play and just be kids. 5 ways to get involved. Lots of oprtions! Click here to donate your way. We are good at win/win business deals. Click here. Easy and fun. Click here to find out how. Have a party! Click here for info. Donate to one of our current projects. ​ playgrounds built so far. ​Click here to find out where we build them. As of mid 2018, we've built 225 playgrounds in war-torn regions such as Afghanistan, Iraq and Palestine. The average cost of a playground is $7,300 CAD. Our completed playgrounds provide safe play for more than 600,000 children, giving them fun and respite from the conflict around them. Our playgrounds encourage attendance at school and help children learn in class. We engage local people and NGOs to find schools and communities with the strongest need for a playground. We support buying local equipment and supplies, and use local contractors to build and install the playgrounds. We stand up to the most rigorous of accountability and financial diligence through on-the-ground monitoring and financial tracking. Acceptance, kindness, respect and tolerance. ​ “What is the best gift a parent could give a child? … A happy parent”. A playground creates this. It is an oasis of happiness. Our park benches in each playground are for parents to meet and talk, and to watch their children play.​ Happy children in turn create happy parents. A happy community is strengthened towards peace. It can all begin in a Playground. It's time for more play! Help us build another playground now! Lush Cosmetics has been a long time supporter of Playground Builders. Lush donates 100% of Charity Pot's purchase price to grassroots organizations like ours. To see how we work together, click ​​​​​​​​​​​​​ HERE . The great people at Love Child Organics believe that businesses have the power to truly effect positive change. For this reason they donate 1 cent of every product sold to non-profits that support children, including Playground Builders. To see how we work together, click​​​​​​​​​​​​​​​ HERE. Joey and the people of The Adventure Group in Whistler have supported Playground Builders for many years by funding at least 10 playgrounds. For more about this generous and giving tours and activities company in Whistler, BC, click ​​ HERE . In support of Playground Builders, Peekaboo Beans Play Stylists donate a portion of their commission on a monthly/annual basis, and in turn, Peekaboo Beans matches every donation. To see how we work together, click​ ​​​​​​​​​​​​​​​​​​​HERE.